EDIT - Most of the pictures of this layout were lost some time ago in a forum crash. A few pictures can still be found from page 55 onwards. I am currently looking through a selection of pictures to repost. Although you have only recently been introduced to my "Dreamland" layout ( Dreamland - http://www.all-model-railroading.co....ead.php?t=5305 ), the layout itself is now a year old, being started early September 2004. It was good practice to get back into railroad modelling, was a nice small size so as not to be too bigger project to start with, and intended to fit in the car for transport to exhibitions. It fullfilled the original brief of one loop that could run continuously and a small switching yard which could operate independantly, but at exhibition, it became apparent that I was asking more from it than it was capable of on the 6ft x 2ft board. So here I am, four days after the Sunderland Exhibition with a slight alteration to the original theme ( see title ), a new track plan and a pile of wood in the workshop!! The new layout is going to be in two sections to allow storage and transport to be better. It will also allow future expansion by adding a middle section or replacing one end section. 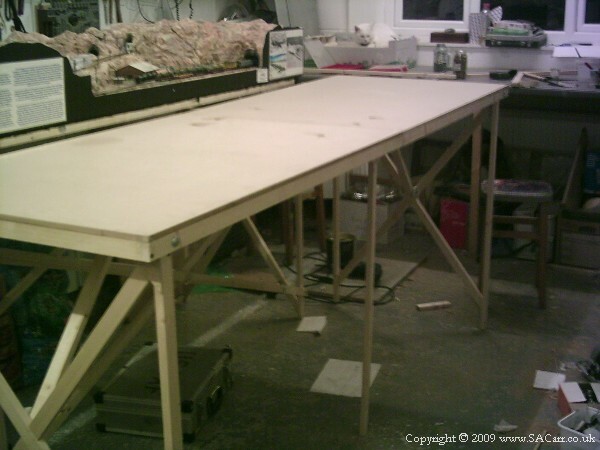 The overall size is going to be 8ft x 2ft 6in, giving two 4ft long sections. I also want the design to assemble quickly and with the minimum of effort, having its own folding legs with the minimum of electrical and mechanical connections. Attached are pictures of the wood for the baseboard and legs. Re: "Area 51" - The Railhead at "Dreamland"
Here's a coloured in track plan. The outer main line is in Red while the inner line to the Air Base at Area 51 is in Blue. The overall trackplan is quite similar to the previous layout because I found it interesting in that trains come and go in and out of tunnels and sometimes they head in the same direction and others they oppose each other. The new design features more yard space, both seen and hidden, plus larger passing loops. The helix has been partly exposed as trains were gone too long in the tunnel, so a rocky ledge has been created along part of the turn. Inclines have hopefully been reduced by the longer and wider boards, and a crossing added near the centre for operator interest between the inner and outer tracks. I don't use digital control so more blocks of track will be created to allow multiple trains on the same line. The new layout will have a 3 to 4 ft hidden yard to the rear, and the front area will have a larger yard area allowing easier operation of three trains on the outer loop, with two stationary in the yard and one clear line through. The larger layout should allow the inclines to be reduced a little allowing longer trains without slipping which has been a problem pulling some cars. The background will be hangars, warehouses, and probably part of the airfield apron with a few parked planes. I have plenty of Area 51 pics to work from. An interesting and operationally challenging feature will be the 60 degree crossing between the inner and outer track, the inner track giving way to the curving outer track. I need to make a spring loaded isolating switch to make the crossing area live only when held, so a train can't run the crossing accidentally. First here's a few tools I use. The main saw I use for all hand cutting is a Japanese Hasunnme Saw. The teeth cut on the back stroke, therefore the blade is under tension and can be much thinner. Because it is so thin ( 0.5mm ), it has to cut much less material, making cutting easier, and the very fine teeth leave a finish that looks sanded, even on cross grain. While the blade is only 0.5mm think, it has no trouble cutting a 2 x 4!!! Some of these saws are so fine that they can cut a pencil line in half!! Next useful tool is my Permagrit sander. This Tungstun Carbide sanding block was bought back in 1994. It has a course and fine side, and has been used and abused for 11 years, yet still has most of the T.C. grit in place. 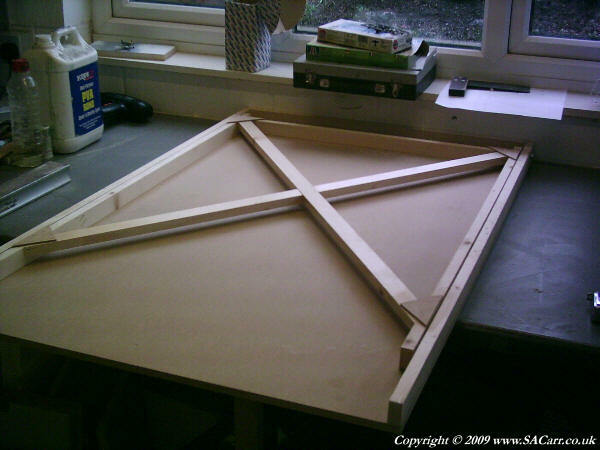 Here's the basic benchwork, a 8ft x 2ft 6in MDF board, with a 2x1 frame. The frame only borders three sides, leaving one end free for the joining straps to link the two sections together. Each section will have one set of legs that will fold into the base for transport. This picture shows the point where the leg will pivot. This is prior to drilling the hole, with a 1/16 ply reinforcing on the hole position to prevent the wood splitting along the grain. The end of the leg also has a 1/16 ply plate to prevent splitting. 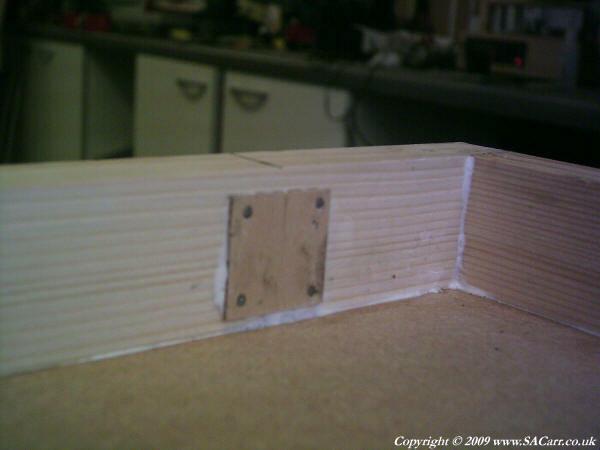 The next picture shows the leg clamped against the frame, just prior to drilling the 8mm pivot hole. 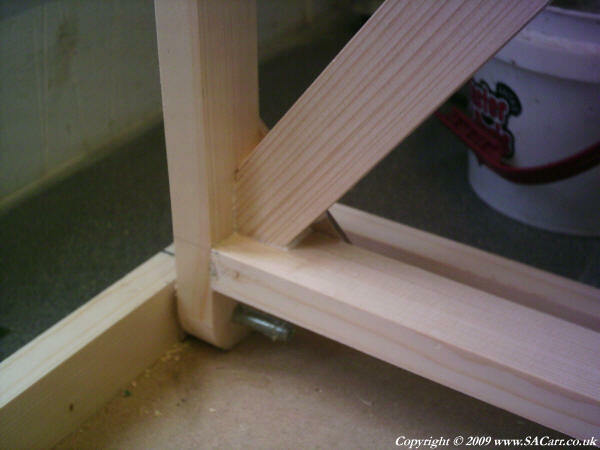 Here's the pivot on the legs, with diagonal bracing just visible. Here's the completed legs on the first section to be completed. The stays to hold the legs in the down position are yet to be made.